His popularity well established, this is to Africa that Tintin now sets off. The Adventures of Tintin, reporter at Le Petit Vingtième, in the Congo(1931) is a naïve depiction of the colonial times and paternalistic views as they existed in Belgium in the early 1930's,. For this new story, Hergé will improvise. Tintin becomes a sorcerer in the Babaoru'm Kingdom. He will outsmart the traps of the gangsters who want to take control of the diamond production of Congo. On 5 June 1930 readers of Le Petit Vingtième were told that Tintin and Snowy, barely returned from the Soviet Union, were about to travel to the Belgian Congo. The announcement had been made in the magazine and pictures even showed Tintin choosing what he would take with him from the "Congo" section of the Bon Marché department store. All the same, Hergé's intention had been to send the little reporter to the United States. Following his critical "report" on communist Russia, he wanted to lift the lid on the failings of American capitalism and pay a visit to the Native American Indians. Why the Congo and not America ? Why is it that Hergé sent Tintin to the Congo before America ? At the outset of the 1930s the world was going through a major economic crisis. Millions were unemployed and businesses were failing at an alarming rate. Caught between two opposed world powers run by two contrary political systems - the Soviet Union and the United States - European countries tried to find a third way to exist. Many Europeans were as distrustful of American materialism and productivity as they were of Soviet Communism. Hergé's agenda can be understood in this context. Yet there was a typically Belgian predicament at the time that was deemed worthy of urgent attention by Father Norbert Wallez, director of Le Vingtième Siècle: the lack of enthusiasm among young Belgians for the colonial life. 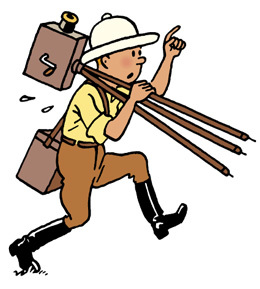 He counted on Hergé and Tintin to drum up some interest in overseas vocations! After the reception organised to celebrate Tintin's return from the Soviet Union (8 May 1930), Le Vingtième Siècle promised readers of Le Petit Vingtième that: "Tintin will rest for a few days after which he will leave for a far-off country with his faithful friend Snowy." On Thursday 22 May, Tintin was pictured on the front cover of Le Petit Vingtième, considering his next move while scrutinising a map of the world: "Where to next ?" The answer came in the issue published on 29 May: Tintin was off to the Congo ! On 5 June, following a train journey from Brussels to Antwerp, Tintin and Snowy embarked on board the Thysville, a ship that sailed from Antwerp to Matadi, the main port and entrance point to the Belgian Congo. PHow did Belgium acquire the Congo ? Father Wallez pushed Tintin towards the Congo. The Belgian minister for colonies got in contact with the priest, proposing a series of positive articles and reports about the presence of Belgium in the Congo. King Leopold II of Belgium took control of the Congo at the end of the nineteenth century, turning it into his own personal fiefdom. Under international pressure the Belgian parliament forced the King to cede the Congo to the Belgian government in 1908. The Belgian people were not particularly enthusiastic about their new gift. The colony was in dire need of administration but the only people who were really making an effort in the country were Catholic and Protestant missionaries. Not many Belgians were interested in taking up administrative roles in the Congo. There was also a lack of people willing to do certain jobs that are crucial in a tropical country: road and bridge engineers, civil engineers, geologists, miners, doctors, teachers, architects, drivers, etc. There was an influx of traders into the country but most of these were Portuguese, Chinese and Greek. Adventurers from all over the world paid visits to the Congo. The Belgian government was looking for ways to interest its people in colonial careers. When Father Wallez proposed Tintin as a promoter, the idea seemed very attractive. Taken a little by surprise, Hergé found himself wondering how he could learn more about the Congo. In the end it was Father Wallez who would provide much of Hergé's schooling in the matter! Yet he also received assistance from his old friend René Weverbergh, director of the monthly Le Boy Scout magazine, who furnished him with a copy of Notre Colonieby A. Michiels et N. Laude, the first edition of which appeared in 1922. It just so happened that René Weverbergh had published the book himself. Monseigneur Schyrgens, literary columnist for Le Vingtième Siècle, provided two books: Le Congo belge and Miroir du Congo belge. Hergé also made enquiries via the Compagnie Maritime Belge, which had a monopoly over sea travel between Belgium and the Congo. He found out about the route between ports, which he reproduced in Tintin in the Congo, and learned about life on board an ocean liner. Hergé took time to visit the Museum of Central Africa in Tervueren, in the Brussels suburbs. He came across stuffed lions and crocodiles permanently set in menacing poses. But the most inspiring exhibit he came across was a mannequin of a leopard-man from a terrifying African cult. The history of this group has never been firmly established. Were they African highwaymen, nationalist Africans opposed to colonial rule or a secret society, the aims of which remain a mystery to this day ? In the end the leopard-men were probably a bit of all of the above. They struck fear into the hearts of anyone unfortunate enough to cross their paths. Covered in leopard skins the mysterious tribesmen used claw-like clubs or gloves with claws to attack their victims. It is possible that the young Georges Remi had already seen these leopard-men at the cinema or read about them in popular books. Edgar Rice Burroughs, author of Tarzan, depicted the leopard-men as the archenemies of Lord Greystoke. In 1957 one of Hergé's assistants, Jacques Martin, referred to the leopard-men in his hero Alix's adventure La Griffe noire. As soon as Tintin in the Congo began serialisation in Le Petit Vingtième on 5 June 1930, Congolese readers became impatient. When would Tintin be arriving in their country ? His boat trip seemed never to end although copies of Le Vingtième Siècle, and therefore Le Petit Vingtième, were arriving in missions in the Congo. From 6 July 1930, letters began arriving at the editorial office. One of the missionary fathers had written: "My little natives are extremely excited about Tintin (...). They have invited him to come and stay in the village for a few days. So many things have been said about this particular frame. Tintin teaches his Congolese pupils the quintessence of their homeland : Belgium ! Hergé quickly became aware of this prejudice and in as early as 1946 he revised the book, deleting everything that he considered offensive to Africans. He undertook this editing process despite the fact that Belgian schoolbooks were still referring to "Negroes" and depicting them as backward and inferior as late as 1960. Al Capone in the Congo ? Even though Hergé was relatively undisciplined in his research at the time, he still had a keen nose for current affairs. Tom and Gibbons are unveiled to be right-hand men to none other than Al Capone, "Scarface, King of the Chicago gangsters." Hergé hadn't lost sight of Tintin in America, which he was itching to tell to readers of Le Petit Vingtième. The presence of American bandits in Tintin in the Congo was based on reality. The rich Congolese subsoil, especially that in the region of Katanga, was highly coveted. Copper, gold and diamonds are in plentiful supply: "All you need to do is help yourself", enthused one colonial governor. The Congo soils are also rich in Uranium which Belgium sold to the United States during the Second World War, facilitating the construction of the two first atomic bombs which were dropped on Hiroshima and Nagasaki in August 1945. Traffickers of all kinds and unscrupulous explorers were also part of the colonial adventure, and in this regard Hergé again proved to be an astute observer. One of the first book that I’ve read and still I can remember most of it! Im wonder why this album is marked to published in 1991? I did readed this in -80s and still have this colored album in my collection. Could be from late -70s also. Just wondering the actual year it was published as similar colored album. This album could be banned in these years easily, maybe its the reason it never made cartoon movie series like the rest of them. Still its nice to be able to see old times and thoughts in comic. Piece of history. Piece of childhood. Brings back lots of memories. Unique style of drawing. Thanks for the app! I’ve been a fan of Tintin since my childhood but why are the dialogs different than the the printed versions (and scans on the internet)? This is so annoying and keeps me from buying one of these versions. Not reliable. Nice publication! Any plans for a Chinese Mandarin version? Imagine the market potential! Lol. Maybe you also want to consider incorporating language learning features into the app...Good luck. I have loved Tintin and his adventures all my life, glad to see this awesome app. Hope it is very successful. As an avid follower of Tintin and collector of books and memorabilia since the age of 5 in 1976 and as an amateur Tintinologist I must say I am most pleased to be able to buy these beautiful Tintin Digital Editions on the MoulinsArt Tintin App! Excellent version. Looking forward to seeing the rest of the books in digital format. The first in the English digital collection. Wonderful, enjoying each page of adventure and Hergé artwork. The extras are a huge add-on to the digital version. Looking forward to the next albums. Perfect that Tintin goes digital! Is there any plans to release in Swedish language to? So glad that the English versions are being added! Waited so long for this! Tin tin is amazing!! I am soooo excited that the English version is not available. I have been a Tintin fan since I was 8 years old. Tintin in Congo may be controversial but it is great book for entertainment. Looking forward to the other books being available in English in this App. My book of "Tintin in the Congo" has just come in the mail.I'v read it,and it's great! I wonder if the 1991 edition of tintin in the congo, which was a republishing in English of the original black-and-white 1931 edition, has all the same content that the 1931 version had. I also wonder if it is restored in color or black-and-white. And is the 1991 English version still available in stores, or is it only the 2005 version? I would like to know because i feel that the original has a more authentic feeling to it. Can anyone answer?